Joy, a co-digiscrapper of mine at Phil. Digiscrapper Forum, challenged everyone of us to post photo a day and i thought I'd join the fun. I know I can't post each day (esp. i'm leaving soon) but i will try it. 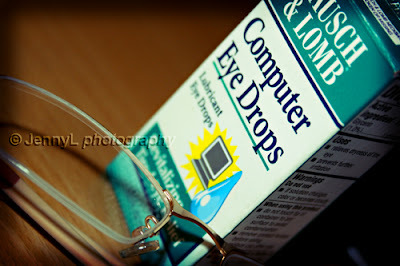 Ok here is a photo of my eyedrops and my eyeglasses. My eyedoctor prescribed that eye drops (Bausch and Lomb pa pwede naman EYE-Mo o Visine hehe) to me when i visited him last year bec. i keep on complaining that my eyes still hurts and i could not see clearly when i ma using my pc even though i have my glasses on. I still hate my eyeglases up to this day that i wanted to chuck it in the bin, i rarely use it (it must be the reason why i am having migraines all the time) bec. i don't think it helps my vision. It was so expensive but it has no use.. grrr. i told my eye doctor about that but he would not let me change new glasses. Next time I have to go and see a new eydoctor.